Classic =w= has been in my head all morning. Bueno! …you should make this lemon curd. Then, put a spoonfull into a cup of vanilla yogurt. Or fill cupcakes with it. Or spread it onto a leather boot and eat that. Anything will work. Put egg yolks into a medium heatproof bowl; set aside. Whisk together lemon zest, sugar, cornstarch, and salt in a medium saucepan. Add 1 1/2 cups water and the lemon juice; whisk until sugar and cornstarch have dissolved. Bring to a boil over medium-high heat, whisking constantly. Cook 2 minutes. Reduce heat to medium-low; gradually whisk one-third of the lemon mixture into the reserved egg yolks. Pour entire mixture back into the saucepan. Cook over medium heat, stirring constantly, 2 1/2 minutes. Remove from heat, stir in vanilla. Pour into a bowl; place plastic wrap directly on surface. Refrigerate until firm and cold, at least 1 hour. Additional storage note: I have kept this curd refrigerated in a plastic container for close to a month and it never seems to go bad. The first time I made this curd, it was for a Lemon Layer Cake with Blueberries, in case you’d like to get started with a summery dessert. I went for a run yesterday after a really long stretch of inactivity. After the run, I continued with the additional meditative activity of hitting a tennis ball against a wall at a nearby school. Bounce, bounce, bounce, bounce, serve, repeat. When I got home, I sat in the backyard and watched Milo for a few minutes. Milo is a robin that hangs out pretty regularly in our yard. I decided to name him a few days ago and sort of instantly regretted it, because my emotional investment in him has increased exponentially. Now, if he doesn’t show up for a few days, I’m going to worry. I’ll think about him all winter. And what if he goes and lives in another yard next spring? I don’t think this kind of relationship is going to be good for me. From now on I’m only naming rocks and plants. When I was a kid, probably six or seven years old, I found myself alone with my mom’s collection of makeup. I experimented with at least one of the products and then went about my day. Later that night, I was sitting in bed crying (I think it was regarding an unrelated matter, but I can’t say that for sure). My mom sat next to me, put her arm around me, leaned in and said, “I think your mascara is running.” I’m convinced this is why I am averse to makeup to this day. When I was in fifth grade, I had a crush on (my now best friend) Nate. The school had recently implemented a postal system of sorts, where kids could write letters to their friends in other classes, put them in an envelope, and have them delivered. Not really sure what the point was, but anyway, it existed. I had the brilliant idea to send Nate a letter that said something to the effect of, “Dear Nate, I like you. Do you like me? Circle one: Yes, No. From, Rachel.” I should also mention that we were in the same class, so in theory I could have just handed it to him. But no, I used the system as it was designed, so when the mail was delivered, I stealthily watched as he looked at the envelope, opened it, and then called all of the other boys over to his desk. And then they laughed and laughed. I went over to another girl in class and started talking to her about totally random stuff so the boys would think I didn’t notice. Interesting footnote to that story: later in fifth grade, Nate did, in fact, “ask me out,” and we “dated” for a solid couple of weeks until one of us ended it (although we can never agree who it was). When I was a sophomore in college, I went on a trip to MA with my friend Inga to visit her friend at Harvard. There were plans to go to a party the night we got there. Everyone pregamed in the friend’s apartment, but all they had to drink was a bottle of Grey Goose. I was invited to take shots, but declined and said that I would simply drink once we got to the party. So, a little while later we end up at the “party,” which turned out to be a school-sanctioned event at a dorm. Which meant no booze. And it wasn’t the kind of party where there were some people dancing and some people hanging out on the sidelines being wallflowers. Everyone was dancing. So I danced. For about 2 hours. Completely sober. With this boy from West Point named Tommy Yee, who was very nice about it and tried to show me some “moves,” but it was really just terrible. Maybe more to come at a later date, if I can recover them from the depths of my subconscious…? I don’t think you can be a Children’s Librarian without being willing to get a little dirty. Guy: When is your internet going to be back up? Me: Let me run inside and ask. Guy: You’ve got green paint on your forehead. In the era of digital music, it can be very easy to erase your musical past. In the days of cassette tapes and CDs, we were physically linked to the tunes that we chose to listen to. For instance, my current music library on iTunes does not really suggest that, as a young, impressionable teen, I was highly into the music of such punk bands as Blink 182, Green Day, Midtown, Sum 41, Newfound Glory, Fenix TX, and the like. While I still have some CDs floating around, and some of these bands have made it past the digital divide (namely Green Day and Midtown – great for the gym), the rest of that stuff essentially disappeared as I came of age, so to speak. My point (which I am slowly losing track of) is that, with kids today, they’ll have no record of their musical past unless they actively choose to keep one. If they like a song now and are embarrassed by it five years from now, they’ll just delete it. 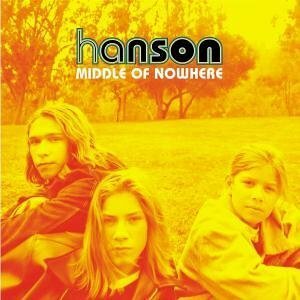 This is why I choose to keep MMMBOP by Hanson on my iPod forever. Do I like Hanson? No. Would I like the song now if I heard it for the first time? Doubtful. But I, along with most other sixth grade girls in 1997, was pretty into that song. And if I delete it, there will be fewer things in the world that will bring me back to that time and the memories associated with it. The same principle applies to WANNABE by the Spice Girls and other embarrassing songs that I cannot think of at present. A music library can, and should, evolve as we do. But there are some things that should be kept around indefinitely. Chances are it’ll be something that makes you think, “Ugh, what what I thinking when I was listening to this?” Our music should be an aid in representing not only who we are, but who we were.